Inflatables in strong PVC bag, blower or pump in standard carton. 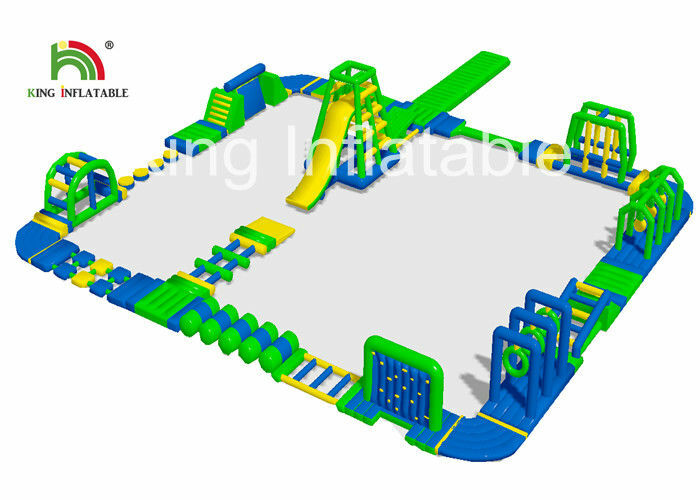 The inflatable obstacle course is used in floating on the water, you can enjoy your fun in it through a race, running, climbing and jumping.The size can be customized according to your activity scene. abrasion, impact and sunlight(UV ). Customerized Or OEM Service We can produce the water game in other shape, any colors you like, or put the logo you need, just tell us your need ,Our great team will help you realize the ture. 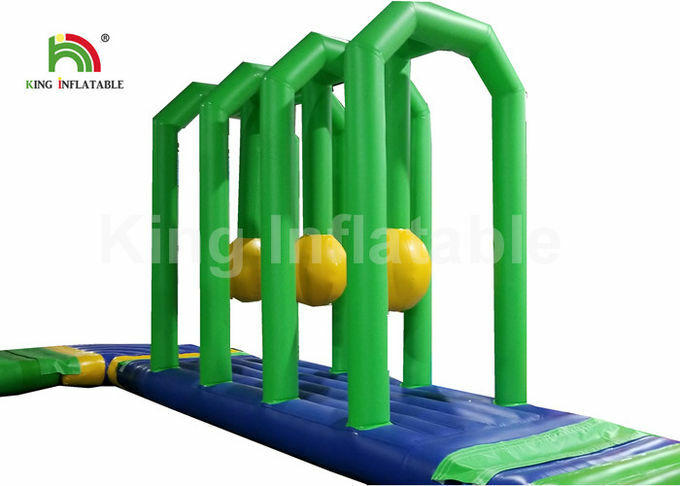 1) We make reinforcements everywhere for the big water park, the connection between items of the park are durable eyelets, the structure can make the giant water park connect very stable. 2) Material: We use best 0.9mm PVC tarpaulin for water games. the best material is very important for the games. 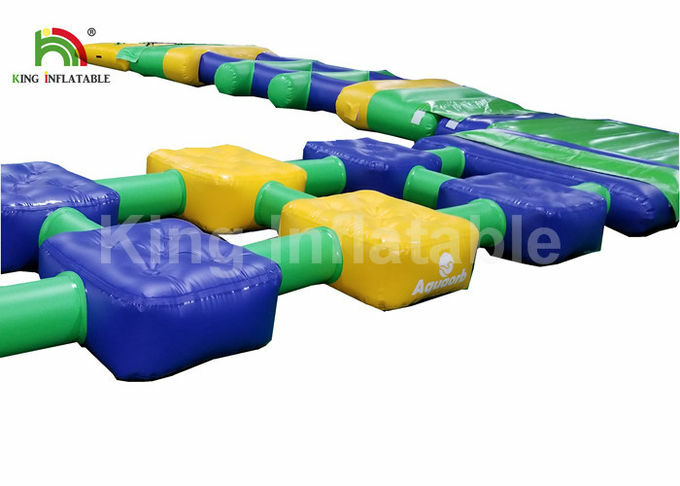 All inflatable games of Topfun are made by high durability fire-retardant PVC Tarpaulin, which has 3 layers, two coated side with a strong net inside. The flame retardant meet BS7837. Our material has improved by the SGS. 3) Hot welding machine: For the sealed water game, it is very important for the welding well. We have advanced welding machine and the best workers in inflatable industry. 4) Printing: Digital print, silk print, or hand painting. The high level painting makes Topfun product will not be sticky and color fade, but sustain a long time. And it print quickly and in good quality. Further more, we make a liquid protecting film on the surface of digital printing. · We use high quality Plato PVC materials. · We double and when requested, can quadruple stitch for added strength. · We can add reinforcement by using seat belt fabric on the bouncing surfaces and on corner joints. 1. Computer design to customer's individual requirements.Logo can be printed as your requirement; other colors and material are also available upon request. 2. Professional research and development. 4. 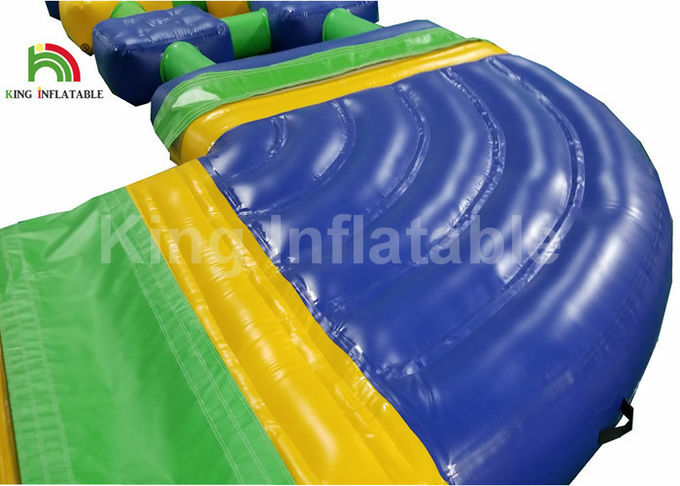 Our products include air sealed welded inflatables and permanently inflated products and other inflated products. 5. Our products meet European Standards CE EN 14960. 6.When the goods are shipped out, we will track your order and keep you updated. 7.All your information is in well protection. A: Yes, send us details and a sketch or a picture of your requirements, then we will do it for you. Q: What kind of guarantee you give? product. If it is damaged, you can use repair kit (glue and same color material) to mend it, and we are happy to guide you through if there’s any problem. Q. How long will it take to make any of these inflatable military/relief/army tents if they are not in stock? The regular inflatable military /relief tent usually take 3-5 days, And if you want to make more orders can take anywhere from 10-15 days. Custom made orders take about 10-30 days, depending on the quantity, size and structure. Q. What is your Standard of producing? CE, EN14960, EN 71, ISO9001, SGS.